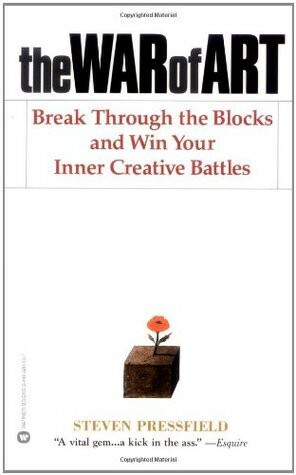 “The War of Art: Break Through the Blocks & Win Your Inner Creative Battles” is written by Steven Pressfield, author of other self-help bestsellers like “Do The Work” and military history like “Gates of Fire: An Epic Novel of the Battle of Thermopylae”. His writing, in “The War of Art” is episodic and reads like a set of blog posts. “The War of Art” is a book about breaking the barriers that limit us from being creative. Steven Pressfield calls this force or energy that bottles up our creativity as “Resistance”. He takes a meta-physical look at “Resistance” and transcending it. This is a seminal book on creativity and motivation. It is a favourite of many notable personalities and is usually part of any book collection dealing with self-help. This work is relatively short. It is divided into three sections (or “books” in the parlance of this work), each of which focuses on an aspect of Resistance. Book 1 deals with the concept of “Resistance”. We are given a tour of the various symptoms and its attributes. Book 2 deals with overcoming Resistance. Here, we learn about being “professional” and various aspects of professionalism as defined in this work. “The War of Art”, as mentioned before, feels like blog posts put together. This is good, in the sense, that the reader can consume content as episodes. The episodes have descriptive names and are easy to remember. For example: Book 1 has content like “Resistance is Internal” and “Resistance and Procrastination”. These are usually half a page to two pages. I like the structure since it makes it accessible to many people including those who do not read often. I found Book 1 and Book 2 to be excellent in their depiction of resistance and professionalism. “The War of Art” lost me in Book 3 which went too deep into abstruse concepts. I found the messaging to be similar to a lot of what our great Indian epics say. This was nice to see especially since Steven Pressfield alluded to them in certain episodes. This book is a brilliant at motivating people to get off their posteriors and work. I mentioned earlier that the third part of this book was where it lost the plot. In addition, I found this book to be lacking in execution i.e. the reader is likely to be motivated at the end of the book but the reader will also be stymied by the lack of a plan or structure to get to actually start work. I had high expectations for this book, considering its antecedents. While this is a good book on motivation, I admit to being a bit disappointed. Some of it is because similar concepts have been used in other books. It is like watching a film classic for the first time and being disappointed. The movie would have been the first of its kind but is now copied over and over and the parts that made it famous have almost become a parody. It is the same for this book in my opinion too. “Deep Work” or “Originals” have areas which overlap with “The War of Art”. Deep Work especially was different since it also talked about the how of execution and now just the why. I would still recommend this book. It is a great motivational work and should be read along with other books which focus more on execution.